Hollywood believes in "God," but who do they say Jesus is? 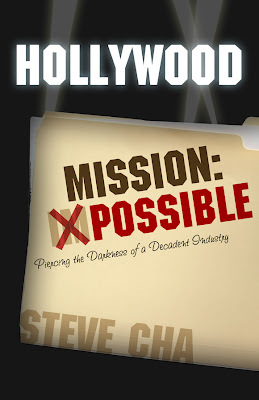 Hollywood Mission: Possible tells the true story of Steve Cha, a Christian who infiltrated Hollywood with the purpose of carrying out one mission: to bring the light of salvation to those entrapped by the powers of darkness. During his three-year journey, Steve evangelized many famous actors, actresses, directors, and aspirants in Tinsel Town. Though he faced obstacles and threats along the way, Steve survived the mission, and now opens up his undercover file for the world to see. Steve’s revelatory autobiography recounts how the gospel was shared with celebrities such as Steven Spielberg, Brad Pitt, Harrison Ford, Dan Aykroyd, and many other stars. Unprecedented in the genre, Hollywood Mission: Possible will enlighten, humor, shock, and ultimately inspire readers. Its evangelism scenarios provide a solid script for Christians willing to answer God’s casting call to bring spiritual light to the entertainment industry, and most importantly to the world. “You may not agree with Steve’s methods, but this book will motivate you to be a more passionate evangelist. Hollywood Mission: Possible is a fast-moving look at Cha’s life, as well as his approach to evangelism, but ultimately it ends up making the reader ask this question: Am I doing all I can to reach the lost? “Whether you are a Christian who shares his/her faith, a Christian who doesn’t, or simply a seeking unbeliever, I highly recommend this book. Never before have we witnessed firsthand the gospel being preached behind the scenes on actual movie sets and TV shows!"